SPSS OMS (short for Output Management System) can convert your output to SPSS datasets. As we'll demonstrate in a minute, this can save you huge amounts of time, effort and frustration. We recommend you follow along by downloading and opening course_evaluation.sav, part of which is shown below. generate the charts one by one. Unknown to many SPSS users, there's a much -much- faster way for getting this job done. It's called OMS. We'd normally always start with a routine data inspection but that's been done for you in this case. Now, a fast way for just running the desired correlations is by using SPLIT FILE. The syntax below shows how to do so. *1. Split file by study major (pyschology and so on). *2. Show only variable labels in output table. correlations q2 to q6 with q1. Right, we created our correlations but they're in our output viewer window. We can't create charts from tables in our output window so we need this correlation table in data view instead. We'll do just that by navigating to Utilities OMS Control Panel which is shown below. We'll follow the steps in the screenshot: we select our correlation table in the left half of the dialog. We then select New Dataset in the right half of the dialog. “cords” is short for “correlation dataset”. Clicking Paste triggers a popup dialog confirming our OMS request. Just ignore it. Clicking Ok then generates the first block of the syntax below. We then (manually) added two lines to it. *1. 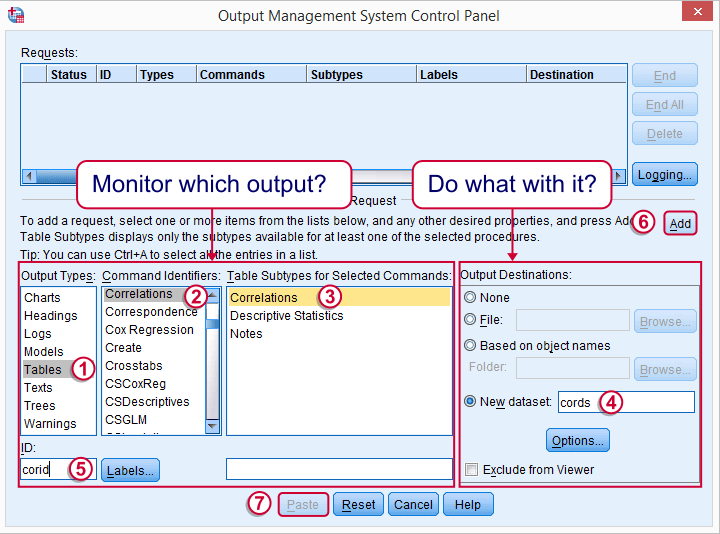 OMS syntax generated by SPSS menu. *2. (Manually added) correlations command. *3. (Manually added) omsend command. 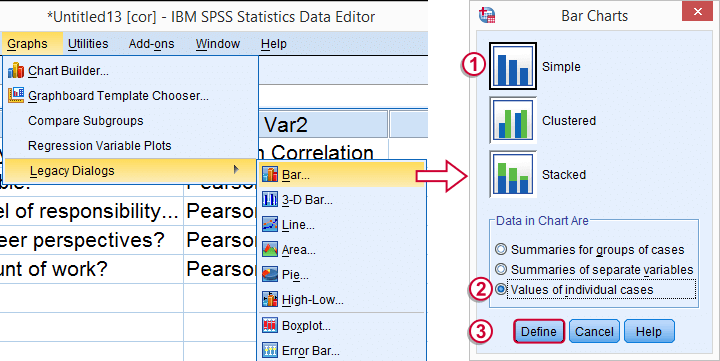 SPSS OMS Syntax - How Does It Work? our correlation table is captured by the OMS. OMSEND then stops SPSS from monitoring output and create our desired correlations dataset. We now have our correlation matrix in an SPSS dataset, which allows us to run charts on it. We'll prepare these data a tiny bit before doing so with the syntax below. *1. Activate newly created correlations dataset. *2. Delete all rows that don't hold correlations. select if char.index(var3,'Pearson') > 0. *3. Split file by var1 (= study major). sort cases by var1 howdoyouratethiscourse. We'll now create our desired charts by following the figure below. Since we're using SPLIT FILE, we need only one single command for creating all charts at once. In the second dialog (below), choose a nice main title for your charts. We decided upon “Correlations with Course Rating”. Following these steps results in the syntax below. Running it generates all desired charts. GRAPH /BAR(SIMPLE)=VALUE(Howdoyouratethiscourse) BY Var2/title 'Correlations with Course Rating'. We now have the charts we wanted. A nice trick to make them look great with little effort is creating a chart template for them. We double click just one of our charts and transpose it as shown below. Next, we change the colors, fonts, layout, everything in our first chart until it looks nice. Then navigate to File Save Chart Template as explained in SPSS chart templates. Finally, we activate the chart template we just created (step 3 below, first set path to .sgt file correctly). We then rerun the GRAPH command we pasted and ran previously and - there you go - five pretty charts in a split second. If you ever get a similar request for different data, you can now rerun your syntax on it and you'll be done in seconds. As a bonus, you can probably (edit and) reuse your chart template other bar charts too. *1. Apply variable label (shows up in chart subtitle). variable labels var1 "Study Major". *2. Suppress excessive decimal places. *3. Activate newly created chart template (set path appropriately). *4. Rerun all graphs at once with chart template. *5. Switch off chart template for any future graphs. created a histogram for visualizing our sampling distribution. As we see, SPSS OMS opens up a lot of possibilities. We hope it'll help you save time and effort as well! First try OUTPUT EXPORT for this. Avoid printing the syntax to the output viewer by running SET PRINTBACK OFF. before running the tables. If that's not an option, try to remove all undesired output with OUTPUT MODIFY and then go for OUTPUT EXPORT. I think OMS is only good for this job if you want unformatted output (just the numbers) in a single sheet. Then send all tables to a new dataset, edit it and save it as .xlsx. Hi Ruben! I have to export to Excel an output of hundreds of tables. I'd like to exclude from the Excel file whole the syntaxis and export just the tables. Do you think it is possible? Thank you!